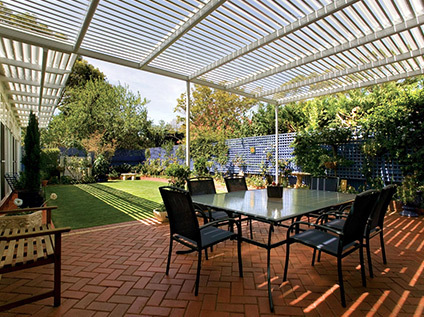 Here at Complete Home Improvement, we provide high-quality Pergola solutions for Australians for 25 years. Whether you plan to use your pergola as your outdoor dining area for parties or as an outdoor entertaining area to entertain family and friends, we have just the design and materials you need. Discover the broad range of pergolas including Timber Pergolas, Colorbond Pergolas, and Aluminium Pergolas to elevate your outdoors today. That’s not all! Our outdoor blinds can almost double the time you spend in your pergola and celebrate their versatility with your family and friends. With beautiful, custom designs to suit all budgets and lifestyle, our experts truly work magic for homeowners across Sydney. Enhance your beautiful home today. Do you want to enjoy outside sunshine with the tenderness of the indoors? Pergolas are great that facilitate you to use the space for your entertaining area, dining room, relaxing space or kids play area. Pergolas are simple yet efficient home extension. To extend your home’s usable living area without compromising the flow of light into your existing living space, add a pergola to your front or back balcony or straight from your living room. This will make your home adaptable and invaluable. What you’ve envisioned for your pergola extension, your personally hired design and build consultant will assist you to achieve your perfect living space. At the time when pergola was invented, it was a simple wooden structure enclosed with vines and foliage and provided direct sunlight in the winter and shade in the summer. However, the contemporary pergola employs innovative design to create your perfect entertaining area whether that’s an alfresco dining, a breezy outdoor relaxing room or a pergola that can alter into a shielded sunroom or extension in the future. Uncover the materials that will best suit your sweet home. If you’ll use a pergola throughout the year and not just use it for warmer months then an insulated pergola is the way to go! With an insulated roof or awning, shield your new entertaining area from sun’s heat or changeable weather. Colorbond is vigorous yet lightweight and is perfect to cover huge areas, thus irrespective of pergola’s size and style you want to achieve, can be achieved. Colorbond steel is made to withstand the tough Australian weather conditions. Colorbond steel’s oven-baked finish won’t break, flake or peel off, keeping your pergola pristine for many years to come. As Colorbond material is highly corrosion resistant, it is also the preferred material for many coastal extensions. Colorbond pergolas are available in a vast array of designs so you’ll find the best shade design to complement your home. An aluminium pergola frame is robust and dependable as well as resourceful and versatile; it’s a well-liked add-on for different home styles. Aluminium pergolas are perfect for small and big areas, as they are made to endure the salty coastal windows and improve airflow with its sturdy, flat profile. If you want to add a striking pergola as your home’s extension or in the outdoor space, contact Complete Home Improvement on 1300 912 293. Our other product range includes outdoor blinds, retractable awnings, sunrooms, and patio in Sydney.